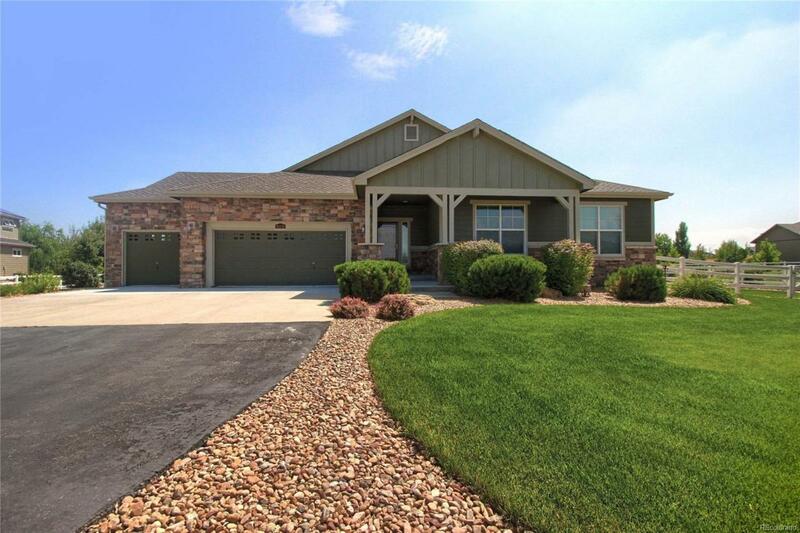 Welcome this amazing ranch style home in beautiful and serene Eagle Shadow South! As you enter you will be greeted by gleaming hardwood floors leading you into the open family room with high ceilings, gas fireplace and tons of windows allowing natural light pour in.The chef's kitchen features all stainless steel appliances, double oven, gas cook top, granite counter tops, pantry and gorgeous cabinetry. You'll love the detail in the adjacent formal dining room with the inset ceiling, indirect lighting and stately chandelier. The master bedroom is complete with an exterior sliding door entrance, vaulted ceiling, 5 piece bath and large walk in closet. Two other bedrooms are on the opposite side of the house which share a full bath. A office may also used as a forth bedroom. Downstairs is unfinished, awaiting your creativity.Step outside to enjoy the huge back patio and gorgeous views! Store your cars and favorite Colorado toys in the 30' X 40' detached garage. You'll love it all!